Our furry friends appreciate treats like yoghurt drops, alfalfa cubes, fruit bars, vegetable treats, etc. However, most of them contain a reasonably large amount of sugar, fat, preservatives or food colouring which aren't exactly great for cavies. Treats are fine but do not overdo them. Giving treats once a month should be fine. As a note, yoghurt drops are quite different from orange drops. The latter contains no yoghurt powder at all. Do look through the ingredients carefully. Treats containing animal products should be avoided. A good example is this vegetable treat from 8-in-1 (pictured below) which contains fish meal. I know it says for guinea pigs but you should know better than to take it as gospel truth! Treats with excess chemicals should be avoided or given very sparingly. Kaytee Nutrapuffs for example contains 2 types of preservatives & a bunch of chemicals. I dunno what they are for but too many chemicals can't be great. Therefore I only buy 1 pack of Nutrapuffs per year! There are other treats to choose from. Regardless of whether the treat contains a bit or a lot of chemicals, remember that treats are just that, treats. Do not feed them too often or worst still do not use them as food 'cos they aren't exactly the healthiest of food compared to hay, veg & pellets. Never feed human treats like potato chips, chocolate, candy, etc! Oats, raisins, sunflower seeds & wholemeal bread can be given in small proportions but remember, these are treats & should not be overfed! According to Melissa, since I have 3 cavies, I can give half a slice of bread every other day. However they get bread barely once a month. They prefer wholemeal bread which is dry & hard. So let the bread air for a day. Some say cheese is fine but I'd advice you not to give it 'cos it is sticky & some say it may cause them to choke. And for crying out loud, remember that cavies do NOT eat meat! When it comes to treats, never follow the feeding instructions on the box given by the manufacturers. They always recommend too much. This is natural since the faster you finish your supply, the more you buy & the richer they become! Use your judgement & always remember that giving less causes less harm than giving more. Treats are just treats. They are NOT supplements & your cavies will not have poor health if given less treats! Treats are purely to give them variety in their tastes & for us to pamper them once in a while. A health conscious human would go easy on stuff like ice-cream & french fries. Similarly you should moderate the amount of treats fed to your cavies if you want them to be in good health. Try not to keep feeding the same treats. I try to ration out my cavies' treats so that each pack or box lasts for 2 months. After I finish the nut stick I may decide to give them yoghurt drops, followed by corn slims, vege puffs, lemon stick, fruit puff, etc. This gives your cavies more variety rather than treating them with nut sticks for the whole year! Salt or mineral wheels are not necessary. 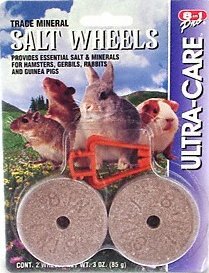 As long as your cavy has a well balanced diet it shouldn't need any addition nutrients be it salt licks or vitamin C tablets. In fact too much vitamin C is bad so don't feed them vitamin C tablets. Just make sure they get enough veg or fruits. The corn wheel on the other hand is fine as a treat provided your cavies aren't too lazy to eat from it. Mine are so lazy that I have to break up the nut stick in their bowl. They refuse to bite from the stick!